The White House is revoking the security clearance of John Brennan, a former director of the Central Intelligence Agency, and mulling pulling them for several other former intelligence chiefs and other officials. Reading aloud a statement from President Trump at the top of Wednesday’s press briefing, White House press secretary Sarah Sanders announced that the president has decided to revoke Brennan’s security clearance, claiming the former Obama CIA chief has displayed “erratic behavior." "Mr. Brennan has recently leveraged his status as a former high-ranking official with access to highly sensitive information to make a series of unfounded and outrageous allegations, wild outbursts on the Internet and television about this administration," Sanders said, reading the presidential statement. "Mr. Brennan's lying and recent conduct characterized by increasingly frenzied commentary is wholly inconsistent with access to the nation's most closely held secrets and facilities the very aim of our adversaries, which is to sow division and chaos." Sanders also specifically cited testimony Brennan gave to Congress last year in denying that the so-called Steele dossier was a factor in the intelligence community's ultimate conclusion regarding Russia's interference in the 2016 election. However, Sanders did not present any evidence that Brennan has actually ever mishandled classified information even as she said the president was fulfilling his "constitutional responsibility to protect the nation's classified information." Brennan shot back at the president on Twitter writing, "this action is part of a broader effort by Mr. Trump to suppress freedom of speech & punish critics." "My principles are worth far more than clearance," Brennan said. "I will not relent." During an interview on MSNBC following the announcement, Brennan said he learned about the administration's decision after a friend told him Sanders was delivering a statement concerning him during the press briefing. Brennan has been a vocal critic of the president since leaving public service. Following Trump's press conference in Helsinki with Russian President Vladimir Putin, Brennan called Trump's performance "nothing short of treasonous." One week later, Sen. Rand Paul, R-Kentucky, a national security hawk and Trump ally on Capitol Hill, announced on Twitter that he met with the president at the White House to tell him "John Brennan and others [sic] partisans should have their clearances revoked." Shortly after, Sanders announced that the White House was not only looking into revoking the clearance of Brennan but former intelligence officials like FBI Director James Comey and former Director of the Central Intelligence Committee Michael Hayden as well. Both the White House and the National Security Council declined to comment on the process that went into removing his clearance, or the administration parties involved. It's unclear when the White House made the final decision to revoke Brennan's clearance, but it goes into effect immediately. The president's announcement comes as the White House has been on the defense and inundated with questions about salacious claims made by former Trump advisor Omarosa Manigault Newman in her book, "Unhinged." Brennan might not be the only former official to lose security clearance. Sanders said the president is also more broadly reviewing access to classified information by government officials and named others who are also now under specific review: James Clapper, the former Director of National Intelligence, James Comey, a former FBI director who Trump fired last year, Michael Hayden, a former Director of the National Security Agency, Sally Yates, a former Deputy Attorney General, Susan Rice, a former National Security Advisor, Andrew McCabe, a former deputy director of the FBI, Peter Strzok a recently fired FBI agent, Lisa Page, a former FBI lawyer and Bruce Ohr, a former associate deputy attorney general. Hayden said the way Sanders made the president's announcement was "threatening." "The way that Sarah Huckabee Sanders rolled this out was almost in a tone to be threatening to the rest of us. In other words, it looks to me like an attempt to make us change the things we are saying when we're asked questions on CNN or other networks," Hayden said. "You have to tell the truth and something's not right or not true, you have to point that out. And that implied threat isn't going to change what I think, say or write." Former CIA Director John Brennan testifies on Capitol Hill in Washington, D.C., May 23, 2017, before the House Intelligence Committee Russia Investigation Task Force. In an exchange with ABC News' Jon Karl, Sanders denied that the president is going after his political opponents with this action. “No. If there were others that weren't, that we deemed necessary, we would certainly take a look and review those as well,” Sanders said. Ranking Senate Intelligence Committee Chairman Mark Warner, D- Virginia, said the president's decision was "Nixonian." "These people were being singled out to have even appointed to this revoke or in the process of being to smacks of Nixonian type practices of trying to silence anyone who is going to criticize this president, "he said. President Richard Nixon's aides famously compiled a political enemies list – although it was secret. 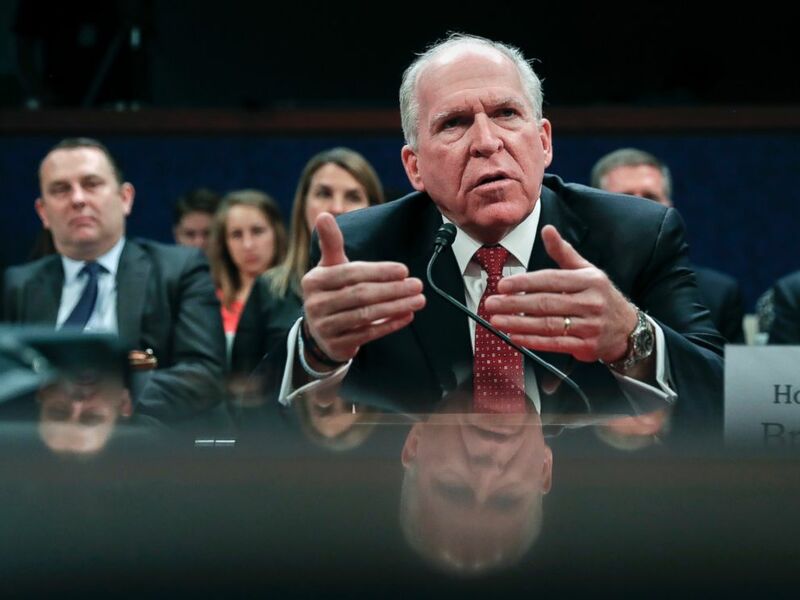 "I've seen this type of behavior and actions on the part of foreign tyrants and depots and autocrat in my national security career," Brennan said. "I never thought I would see it here in the United States."